Melvin, Treva Hall. 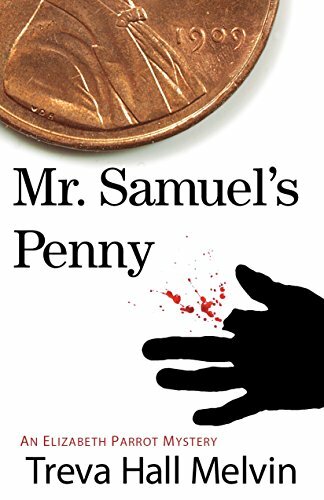 Mr. Samuel’s Penny. 264pp. $10.95pb. Poisoned Pen. November 9, 2014. 9781929345045. Grades 7 and Up. Elisabeth grew up in more ways than one as she quickly realized her summer in the sleepy town of Ahoskie was not going to be as boring as she expected, especially when the sheriff released evidence that the deaths of the father and daughter were not intentional. There were skid marks on the bridge where the car slide off and there were bullet holes. The victims were Mr. Samuels, the owner of the lumber yard in town, and his daughter Emma. The big question raised from the scene was that Mr. Samuels died clutching a collector’s 1909 wheat penny that was included in the sheriff’s crime scene evidence. So what makes this so interesting? Well, the penny ends up missing from the sheriff’s office and no one knows why! Elizabeth takes it upon herself to help find the missing penny, which causes her to cross over racial lines to do it. She decides, deductively, to go to sources in town that harbor pennies such as Mr. Jake’s grocery store. Mr. Jake’s store sees loads of pennies, but Mr. Jake doesn’t like blacks too much which might cause a little difficulty. Then there’s the church collection plate and the coin jars of Aunt Ode. Next up for investigation are suspects such as Ms. Neely, whom everyone refers to as Ms. MsMeanie. She wants to grab control of the lumber yard away from Mr. Samuel’s brother and widow. It is peculiarly bright this evening. Will not be dark for another hour or so. The headlights of the ’68 station wagon are on, but their worth cannot be seen until the fog seeps between the slats of wood. The sweet smell of honeysuckle floats through the air on a blanket of steam rising up from the river as the car makes its way across the threshold. The old bridge aches aloud, for its back has carried many a passenger the last hundred years to and from Ahoskie, North Carolina. Known as “The Only One,” Ahoskie has existed as a settlers’ town and with the Indian name since 1719. . . I was standing at the front door that mid-June evening, waiting for Aunt Alice to come home from the grocery store, when I heard the piercing sound of horns and sirens unleashing their fury, synchronized to the flashing red and white lights leading the way south, away from town. The pimples that ran down my spine hurt from the screeching noise. At least five vehicles rushed down the narrow road, leaving great clouds of dirt as though dragged by invisible ropes behind them. Heading for a place where something God awful was happening. . .
. . . the crane pulled the car up, with a solemn grinding motion, something burst free from one of the car’s open windows. Shocked me so bad I nearly fell over into the deep, so shaken from the sight. Something glistened in rhythm with the ripples of water flowing over his fingers. . .
Treva Hall Melvin, has been a practicing attorney in all levels of government as a prosecutor and criminal defense attorney. A native New Yorker, she graduated from Villanova Law School in Pennsylvania and now lives in the Philadelphia area with her husband, their two children, and their dog Audrey.